A Winter Wonder DEAL For Skin Treatments! We are taking a €70 off our skin care courses! That’s 6 state-of-the-art tightening and toning treatments for the face or body for €400! Just in time for the holiday season, look your best naturally. Learn more about our face treatments and body treatments. Offer includes face or body areas only, no combination of 2+ areas (ex. face and neck, arms and legs, etc.). Offer valid until 28/02/2017. 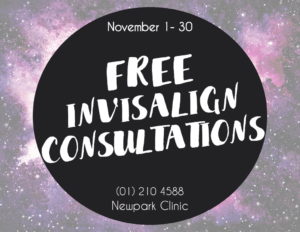 During the month of November we are giving FREE Invisalign consultations (normally €50)! Invisalign clear braces are both removable and virtually invisible, adapting to the modern person’s lifestyle. Dr. O’Donnell is one of three Specialist Orthodontist Diamond providers in the country, delivering unparalleled invisible brace treatments! Invisalign straightens teeth by using a series of clear, plastic aligners that are custom-made specifically for your teeth. You will progress through each aligner every two weeks to gradually move teeth over time.